The Look Who's O-T-H Mini Party Favor Bags are perfect to use as party favor bags and can be filled with candy or other small gifts. 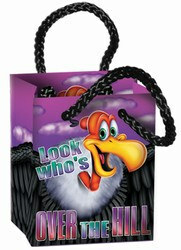 The Look Who's O-T-H Mini Party Favor Bags measure 2 1/2 inches by 3 1/4 inches by 1 3/4 inches. They are sold four in a package. for the guests who come to the OTH party.